Gul Rehan, a labourer from Pakistan's north-western district of Dir, says he has never depended on charity to cope with hunger and poverty before. 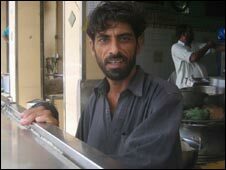 But now he is sitting in a line outside a restaurant in the southern industrial city, Karachi, waiting for free food. Three times a day, men, women and children queue up outside dozens of Karachi hotels for meals which are paid for by philanthropists and charity donors. Until the late 1990s, they used to be mainly beggars and heroin addicts. But now labourers and housewives from the lowest rung of the economic ladder are also joining the queue. The "fall" in Gul Rehan's fortunes is easy to track. "I used to till a couple of acres of my land in Dir in late summer and would then come down to Karachi where I had a job as a security guard at a towel factory," he says. His crop has failed, and the towel factory, like most knitwear industries, closed down last year. Significantly, the phenomenon is older than the recent rise in international food prices. 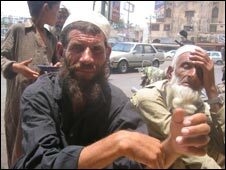 "Labourers started appearing in the beggars' queues some three years ago, and have now become a dominant element," says Mohammad Azeem, who supervises the distribution of food to beggars at Sabri Hotel. 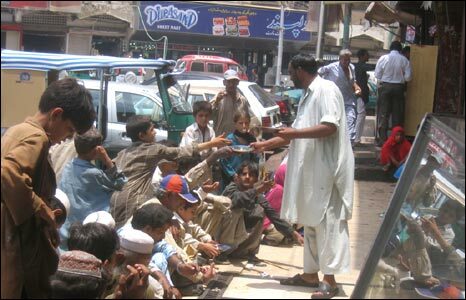 "We feed 600 to 700 people out of charity money each day, and most of them are not beggars," he says. According to Mr Azeem, the queues have grown longer during the last couple of months that saw the Pakistani rupee shed nearly 10% of its value, undercutting its purchasing power. Sabri Hotel specialises in nihari, a spicy dish of beef and gravy, which is popular with the working class because it is filling - and because it used to be cheap. A serving of nihari that cost 36 cents in January now costs 57 cents. Similarly, one half-plate serving of biryani, a locally popular rice dish, is up from 50 cents in January to a dollar. Meanwhile, grocery stores in poorer localities are losing sales due to a two-fold hike in the prices of lentils, rice, wheat flour and cooking oil during this period. "My rice stock never used to last for two weeks. Now it has been here for two months as most people are buying less than before," says Sohail Ahmad, the owner of Sohail and Noman General Store in Neelum Colony, a city slum. The worrying part is that the poorest section of the society may be as large as 34% of the population, and growing, warns Dr Asad Sayeed, a director of the Karachi-based independently-run Collective for Social Science Research. The situation is likely to worsen if the new government, presently caught up in political troubles, fails to focus on the economy. Last week, the country's central bank increased interest rates to 12% to curb inflation and stabilise the rupee. A week earlier, the bank chief, Dr Shamshad Akhtar, admitted in a TV interview that disruption of expected dollar inflows since January had lowered foreign exchange reserves, causing erosion in the rupee value. She said the pressure would ease in June when inflows of over $3bn were expected to enter the system. But even if these dollars arrive, will they translate into immediate relief for someone like Gul Rehan? Dr Sayeed says that unless the global community finds a way to regulate international trading in food staples, poor countries like Pakistan are in for a long and bumpy ride. The government can do little in the short run except devise a mechanism of targeted food subsidies, he says. Such a move will get a boost if dollar inflows promised by the Western countries as a "democracy dividend" arrive. In the medium and long run, the government can review and reshape the policies of the previous government which, according to Dr Sayeed, "achieved higher growth but failed to reduce poverty". For one, the import of luxury goods has to be curtailed and greater emphasis laid on developing and diversifying the export sector. This is a tall order, and will test the will of the new government when it unveils its first annual budget next month. Expect troubled financial times ahead.